How many times have you talked with prospects when they voiced an objection and wouldn’t agree with your answer even though you answered with evidence that was logically irrefutable? Now, maybe, we know why. This morning on NPR’s Morning Edition, I listened to a report on research recently published by Brendan Nyhan, a professor of Political Science at Dartmouth. The research was seeking to understand how parents make up their minds on whether to have their children vaccinated. Listen to the NPR report here. Despite the preponderance of scientific evidence, going back as far as the middle 1700’s when Ben Franklin was urging Philadelphians to get vaccinated against small pox, many parents refuse to believe what their doctor tells them and may be less likely to act on getting their children vaccinated. Ambro.com’s Strategic Sales Tactics training teaches sales people to affirm the objection first, telling their prospect how important their thinking is; how smart they are to have that concern. We call it the Feel, Felt, Found approach. This “I know how you feel” approach to ad-sales objection handling takes the edge off the self-esteem hammering people take when they realize they are wrong. Then by telling the prospect “My other very smart client used to share that concern” we are giving them a face-saving way to change their mind…while associating themselves with another client who did so, too. Shankar Venantam, the NPR science reporter says that “by increasing their self-esteem first” with compliments we might be making it easier for the prospect to make the about- face that is needed, and that is supported by the evidence. Learn more about Strategic Sales Tactics training for your sales team. 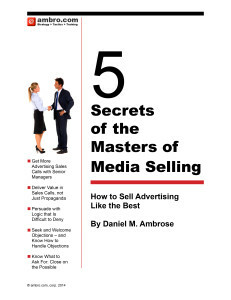 Or follow the next link to sign up a few team members for the public Masters of Media Selling training courses created by ambro.com in partnership with MediaPost.